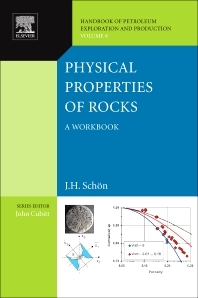 Physical Properties of Rocks: A Workbook is a symbiosis of a brief description of physical fundamentals of rock properties (based on typical experimental results and relevant theories and models) with a guide for practical use of different theoretical concepts. For this purpose a companion web site contains a selection of model based equations in excel worksheets for practical application and training by the user to work with his own data (or to ''play" in order to demonstrate the effects of various input information and to demonstrate the effects of various input information in petrophysical work. In two special chapters the problem of relationships between petrophysical parameters based on various model concepts is presented as a foundation for combined interpretation. This part also contains the author's 'structured model'. The workbook is a result of the more than 40 years experience of the author in teaching at universities and industrial courses. Jürgen H. Schön is a consulting petrophysicist and Honorary Professor at Montanuniversität Leoben. Schön was educated at Bergakademie Freiberg (Mining Institute of Freiberg), Germany, where in 1962 he graduated with a Diploma in geophysics; in 1967 he received his Doctor of Natural Science. In his career, Schön has held a variety of academic positions: at the Bergakademie Freiberg he was Professor and Head of the Geophysics Department (1987-1991). In 1991, he moved to the Institute of Applied Geophysics, Joanneum Research, in Leoben, Austria; where, from 2000 to 2004, he was the science manager of the geophysical institute. In 1993, he was a visiting Professor at the Colorado School of Mines. In 1999 he became Honorary Professor at the Montanuniversität Leoben. In his academic positions he was also a thesis supervisor for students studying formation evaluation. Since 1999 he has expanded his teaching beyond university and has taught training courses (Petrophysics, Formation Evaluation) for industry.